World-renowned economist Vijay V. Vaitheeswaran provides a deeply insightful, brilliantly informed guide to the innovation revolution now transforming the world. With echoes of Clayton Christensen’s The Innovator’s Dilemma, Tim Brown’s Change by Design, and Jared Diamond’s Guns, Germs, and Steel, Vaitheeswaran’s Need, Speed, and Greed introduces readers to the go-getters, imagineers, and visionaries now reshaping the global economy. Along the way, Vaitheeswaran teaches readers the skills they must develop to unleash their own inner innovator and reveals why America and other wealthy, privileged societies must embrace a path of inclusive growth and sustainability—or risk being left behind by history. Vijay V. Vaitheeswaran is an award-winning global correspondent for the <i>Economist</i>. He is a member of the Council on Foreign Relations, an adviser to the World Economic Forum, and an adjunct faculty member at NYU’s Stern School of Business. He is also the author of Zoom: The Global Race to Fuel the Car of the Future (co-authored with Iain Carson), and Power to the People: How the Coming Energy Revolution Will Transform an Industry, Change Our Lives, and Maybe Even Save the Planet. His op-eds have appeared in the New York Times and the Wall Street Journal, and he is a regular guest on NPR’s Marketplace, PBS’s NewsHour, ABC’s Nightline, and other leading programs. 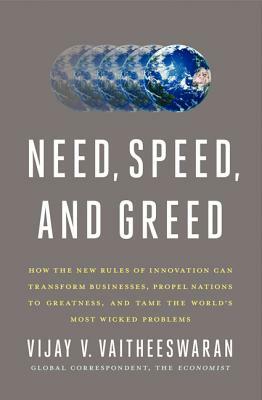 “Need, Speed, and Greed is an absorbing and deeply insightful guide to the wild new landscape of global innovation. It is a must-read for strategists and entrepreneurs alike.